A friend of mine, who is way more into the whole emo/goth movement than I am, suggested this band to me years ago, as they were building their fan base in the U.S., so I gave them a shot. My initial purchase was Dark Light, but later I picked this reissue up. 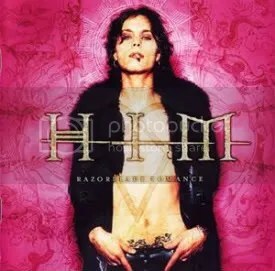 Compared to the original Finnish release, this reissue features three additional songs thrown in: “Your Sweet Six Six Six”, “Sigillum Diaboli” and a cover of Chris Isaak’s “Wicked Game”. Like I said, goth isn’t my style. I’m hair metal guy, but this album is really catchy and has some great moments full of mood & atmosphere. Lead singer Ville Valo has described HIM as being “love metal”. I couldn’t listen to it often, it’s much too melancholy and down at times, it’s easy to get caught up in the music and lyrics. This is really good “I’m goth, depressed and I wanna be loved” stuff! Many parts of this album remind me latter day Sentenced. Their cover of “Wicked Game” is really cool (and is a rocker) and for some reason, I think if they covered a Motley Crue song, it would be amazing. Something like “You’re All I Need” or “Without You”.